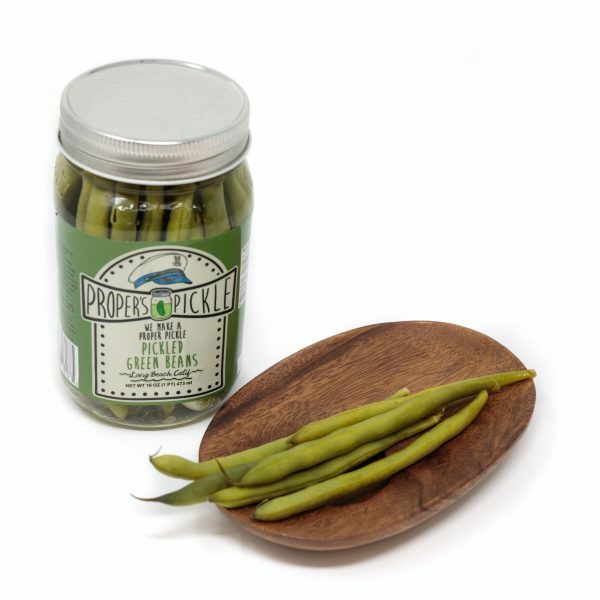 Proper’s Pickled Green Beans 16oz. Home / Pickled Veggies / Proper’s Pickled Green Beans 16oz. Also know as a “Dilly Bean” these crunchy and delicious beans have all the characteristics of a Proper’s Pickle, just in bean form. These beans pop with with garlic and dill with the tartness we all love. Perfect for the occasional Bloody Mary or Dirty Martini. Some people call them dilly beans, other call them pickled green beans, we just call them delicious!!! Either way you have finally found the green beans you were looking for. For centuries, picklers all over the world have been searching for the perfect way to add the right amount of pickled flavor to a green bean while still keeping it crunchy and fresh. Well it looks like that day has finally come. Proper’s Pickle has perfected the pickled green bean (say that five times fast). We use are signature Proper brine and just as in every jar we make you will find that mouth-watering fresh garlic and dill flavor that you love so much. These dilly beans will really get your taste buds excited when you crunch into them. The only way in our minds to eat a green bean is when it is pickled. We see people use them in all types of ways. The most notable, not that we condone, are for Bloody Mary’s. When adding that piece of bacon, jerky stick, or cheeseburger to top your Bloody Mary’s also think about adding some of these lower calorie pickled green beans. After all, is a Bloody Mary Proper without the Proper garnish?!? The brine of vinegar, water, and salt is also great for your drink mix. For those of you that don’t need a drink before noon, chop these beans of deliciousness up and add them to your favorite salad for a little crunchy craziness. Or just snack on them straight from the jar like we do. So if you want to be a part of history one day, pick up a jar of these Proper green beans. You will be able to tell your grandchildren’s grandchildren’s grandchildren that you were there when the perfect pickled green bean was discovered. They will probably just think you are old and senile, and they are probably right, but we will know that you were there! 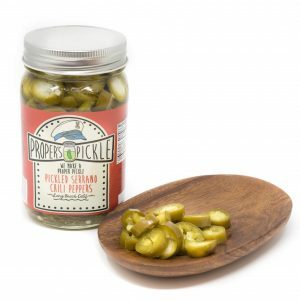 Proper’s Pickled Serrano Peppers 16 oz. 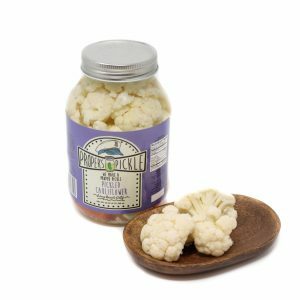 Proper’s Pickled Cauliflower 32 oz.